For those data objects that attributes that can be rendered, you will see a Colors page in the Style node of the Settings page. You can now adjust the values assigned to the colors to suit you needs (for example for Calculated Heads, Concentrations, Kx, etc.). A common application of this would be when you are viewing transport concentrations, and you want a value threshold to be assigned to a specific color (eg. 10 mg/l for a water quality). After a model run, when you first view maps for transient data objects (heads, drawdown, concentration, water table), the color palette you see in the color legend will be a default. The color palette (including min/max values) will be re-calculated each time you change the output time. However, once you load the settings for the specific 2D or 3D view, then the values in the Color Classification will be applied globally for all output times. Load the settings for the desired 2D or 3D view, and you should see the color page below (this example is for Concentration for the Layer (2D) View). 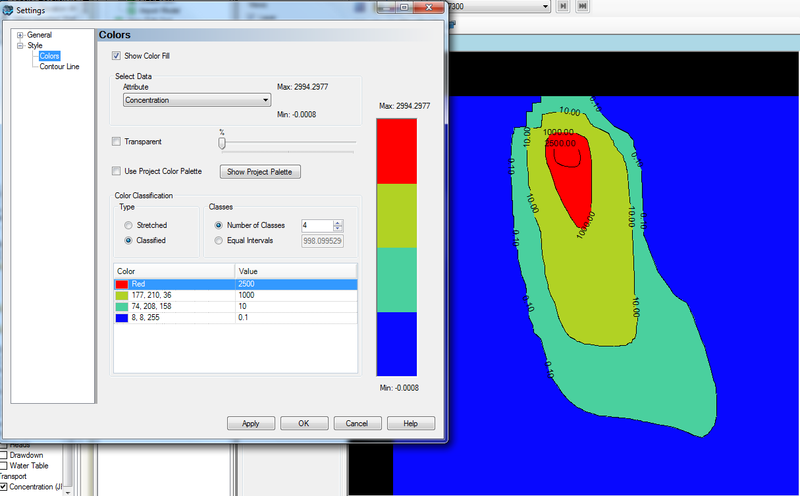 In the grid at the bottom of the window, you can adjust the value that are assigned the various colors. When using this option, you typically should set the Color Classification Type to be "Classified". Doing so, will assign a specific color to a range of discrete values. Enter the values working from highest to lowest (from top to bottom). 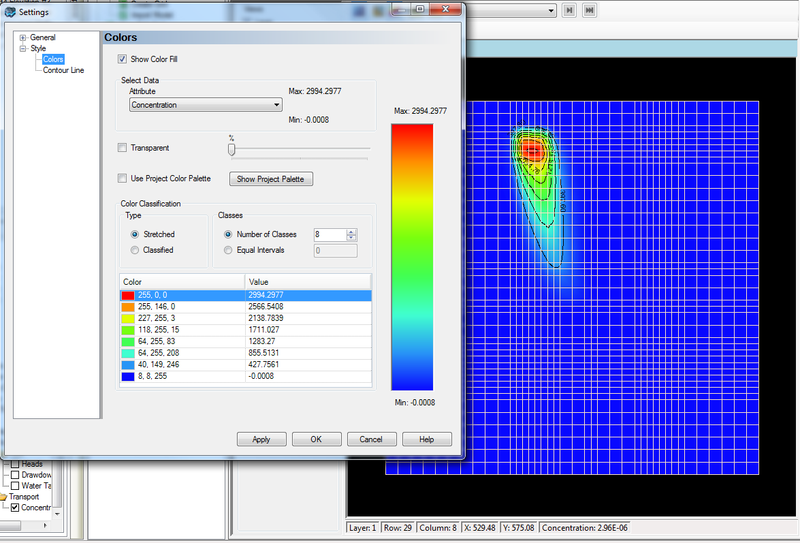 Using the data set and settings from the figure above, the color values were adjusted as follows. 2D viewer with Cells rendering on. As you change different output times, the user-defined color palette will be honored. The settings need to be defined separately for the 2D and 3D View. Once you close a view (e.g. stand-alone 3D viewer), the color values will be lost, and you will need to re-define them. In addition, in the case of rendering for MODFLOW/MT3D results (heads, drawdown, concentrations), the user-defined values will be lost upon re-translating and running the model, so you will need to re-define these values.